We hope you all enjoyed the holiday weekend! 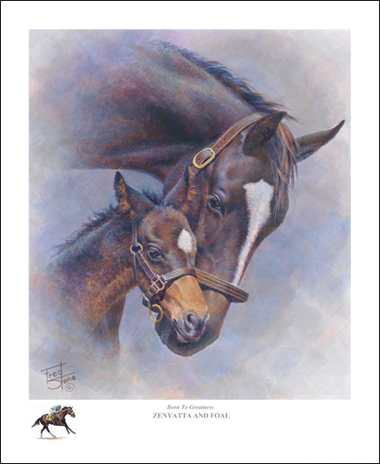 Today we’re excited to announce our rerelease of Born To Greatness by Fred Stone, a print that captures the joy Zenyatta experienced with her first foal. 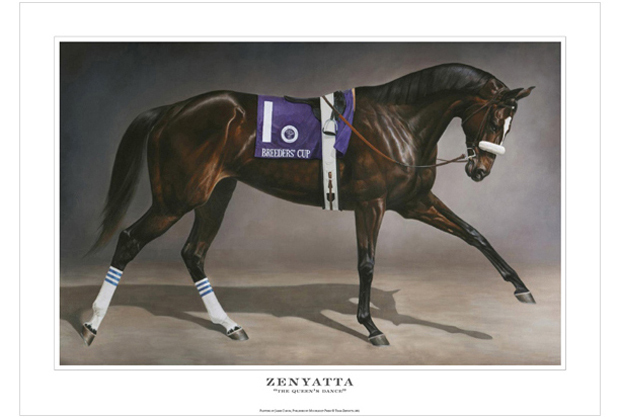 Each print of Zenyatta and young Cozmic One measures a generous 19″ x 23″ and is hand-signed by the artist and printed on the finest archival museum-quality stock. Also available are the two classic posters by Jamie Corum, The Queen’s Dance and Breeders’ Cup Gold. The Queen’s Dance, one of our most popular items, is back in stock and ready to ship. Our Z. is beautiful in any medium–in oil, in watercolor, in photos, in videos, and most of all, in person! Thanks for making these accessible. Always love the Queen’s pictures. Good luck Intense Holiday in your next career. Sorry you won’t race anymore but, looking forward to seeing your offspring. How beautiful they all are. I hate retirement and having to live on an affixed income. After Bills there is nothing left I sure do miss seeing our Z at the track, but She has more than earned her retirement. Looking forward to more Photos, and I truly appreciate them. For far too many of us, have to fight with day to day living, and for just a few moments a day Z allows us to, shelve all of the negative aspects of our lives.I LOVE YOU Big Girl stay healthy and sound. Perky Green, Blessing to you and to all of us who are facing the trials of retirement and getting older. Another beautiful picture of the Queen… She is such a good mommy. 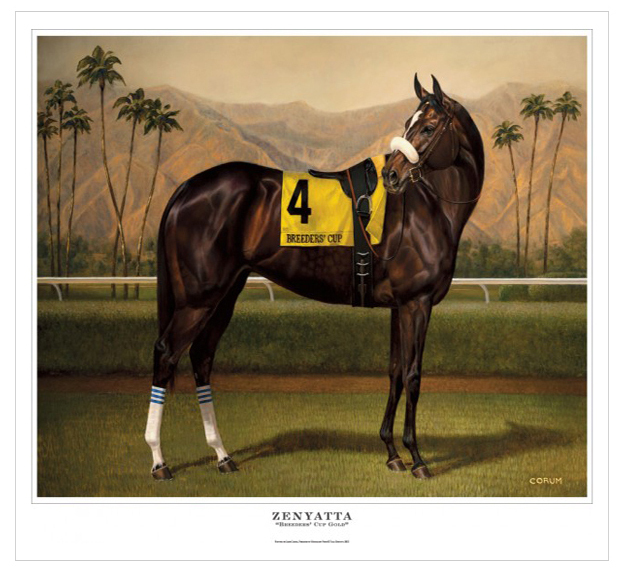 True Perfection is captured in each of these prints…Zenyatta was every bit of that and more. Thank You so much, Ann, Jerry, Lane’s End , for sharing our beloved Zenyatta and her family. Are we on this blog or the other one? I’m perpetually confused–lol! Hugs to all anyway. Go, Chromie! Just like I always say– in hard times, God gives us a special horse. Good night, all, and love you always, Zenny. Zenyatta is perfection and always will be. Stay healthy and strong beautiful girl. Would love to see you in person. All the posters are beautiful but I thing my favorite is Breeders Cup Gold. She looks so strong and confident. Also, shows off those magnificent ears better than the other 2. I really love Fred Stone’s print of momma Z and Coz. It was a “had to have” when it was first introduced and the same for the Queen’s Dance! I have absolutely no more wall space for anything bigger than 8X10!! Ha! Anyone out there thinking about getting any of them, you won’t be disappointed. If there can be two “horses of a lifetime” I hope California Chrome is #2. Zenyatta will forever be #1 in my lifetime. Too much is learned that adds nothing to life. With the advent of “tell it like it is” the flow of troubled water washed in a mountain of debris. The unlearned feel it necessary to empty their garbage into the ears of other people without considering whether anyone wants to hear it. U yo tsv hi, the Cherokee calls it-not music, not poetry, not gracious words-but pure trash. The container may be new and shiny and touched with bits of colorful paint-but inside is the same old decaying ga da ha, (spoken with disgust), and the word is filth. Little things reveal much about a person-but none more than what he talks about, what he laughs at, what he finds amusing-or even helpful. No matter how beautiful or handsome-the tongue tells all. Yesterday I heard something that made me almost cry. Carol, Thanks for the news about Barbie. She could not have landed at a better place. Ms. Banke really loves her girls. Maybe Barbie and Rachel can be buddies. What a pair. Rachel with those eyes and Barbie with that mane. Dear Kathy.Am not sure where to post either!And am running late been defrosting my freezer!Have you seen the wonderful video of the beagles on Zoe’s FB?I could hardly see through my tears, those poor little dogs.I have nothing but admiration for the peeps who save these animals from a life of hell and they ask “what makes us human”!! !Poor Marty is a mixed up kid with the holidays is Tuesday Monday! He’s got Marty pillows now he can give us all a hug!Fubu is seeing his doc tomorrow,I hope they can help him he’s still eating a little.His “wife” Lucy Lu Cove was writing about her sisfur seems she only has about a month left her mommy has leaky eyes,She’s 17 so a good age but will soon become “an Angel graduate” God bless her.Monty and Glesni are working as a team fishing, resting, incubating and chasing off Blue 24 who is still hanging around not a bad day there we’ve been promised rain but none so far! Have a great day.Hugs to you,Kisses for Holly,Nikko and Sugar.Sheena. Yes, I saw the beagles video. Those poor babies! Thank God they’re free now. Marty was funny wishing us a Happy Hump Day standing on an elephant. lol Fingers crossed the doc can still help Fubu. Sorry to hear of his wife’s limited time left. Did you see the adorable pic of Boo in his “Boo rex” costume? CUTENESS OVERLOAD! On Ray’s page Jack O killed the giant tick that had been on Ray’s head.So cute! More power to Monty and Glesni. Blue 24 needs to move on! Have a wonderful day and take good care of yourself. Hugs from me, kisses from Holly, Nikko and Sugar. Kathy. I’m the proud owner of 2 out of 3 :-) I could open a Zen museum because of all the prints, etc. I own and charge admission LOL I received my Zenyatta key chain yesterday. Thank you! I love it! I received my Zenyatta key chain Tuesday and I love it. I just might hook it on my Zenyatta track tote where it can be seen! Haven’t decided yet! @Team Z, Thank you for being here for us. Read Robin Roberts new book and she put everything in perspective for me. I am so grateful that Zenyatta came into my life. She has made my world a better place. Thank you Team Zenyatta and Team Lanes End. What love you can feel when looking at Zenny and Coz! We are so blessed with all that pertains to her. I’m so excited about California Chrome and praying for a safe and successful trip in the Belmont. Wouldn’t a new Triple Crown winner be magnificent!! The pictures are just great! It’s wonderful to be able to check in from afar. Thanks to all who keep up this website and the Mosses for being so generous with their girl and her progeny.